This is a re-visit to a post I did in the first couple months of my blog that pertains to my 31 Days of Nostalgia topic. 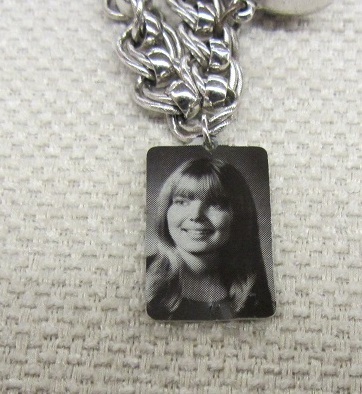 What high school girl in the 1950's - 1970's didn't want a charm bracelet? I know I did, and so did my friends. It was on my Christmas list in the early 1970's, and although it was to be a surprise, my little sister, (eight years my junior), announced that she knew what I was getting for Christmas. She blurted out proudly, that "Craig (our brother) got part, I got part and Gram the main part". From that hint, I knew that a charm bracelet was indeed going to be under the tree for me. Although the charm bracelet dates back over 10,000 years ago, and was popularized during Queen Victoria's reign, it was the Bobby Soxer Era beginning in the 1950's when the charm bracelet became a "must have" accessory for girls. 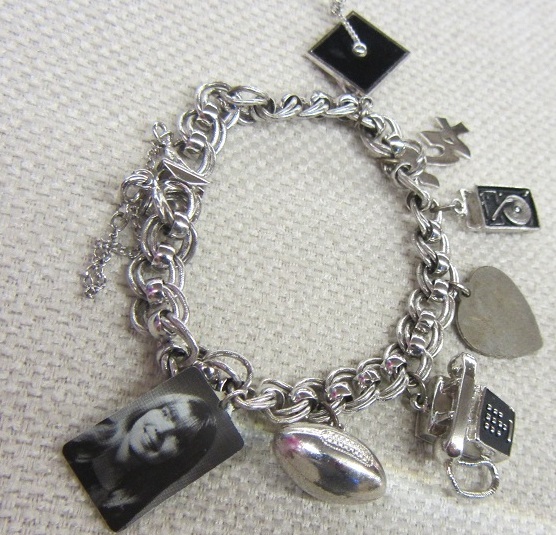 The bracelet's charms recorded major rites of passage, 16th birthdays, graduations, travel, weddings, etc. Charm bracelets began to lose favor during the disco era when bare gold chains without baubles became the new status symbol. Charm bracelets reappeared in the mid 1980's. During my daughters' childhoods, the Italian charm bracelets became very popular. And this is my charm bracelet. It's still in great condition. A football. I was a loyal Vikings follower. 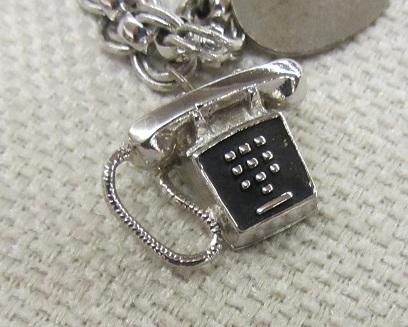 A telephone. What girl didn't like listening to 45's and talking on the telephone? I hope you enjoyed a look back at charm bracelets! I have a charm bracelet too but I received mine from my hubby just before we were married. You have some wonderful charms and I enjoyed looking at them. Maybe I will share mine one of these days. Hope your day is lovely. Those are darling charms! 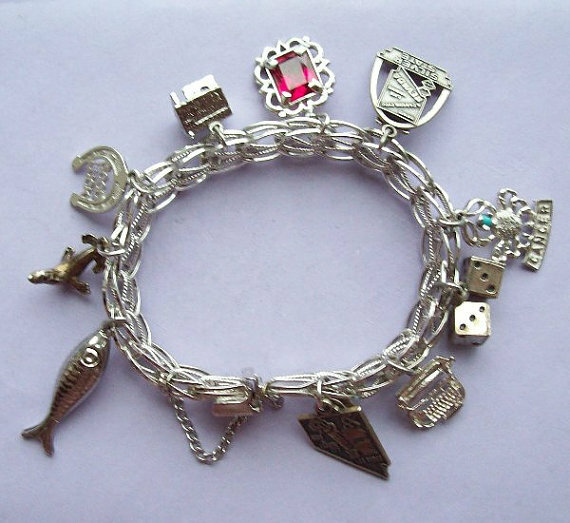 I can't believe I never had a charm bracelet! Love this post! I have my high school charm bracelet also. I graduated in 1968...yikes that was a LONG time ago! I love this! 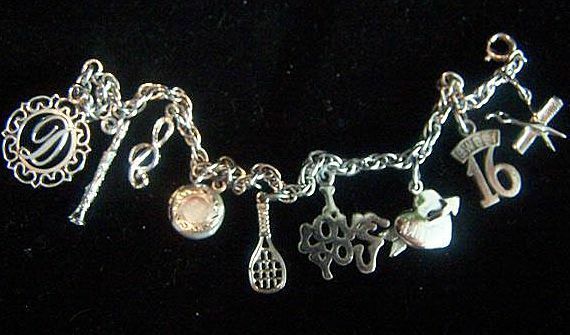 I never did get a charm bracelet, but always wanted one, so I gave myself one about ten years ago! :0) Still charming! Thanks for sharing your wonderful treasure with us. 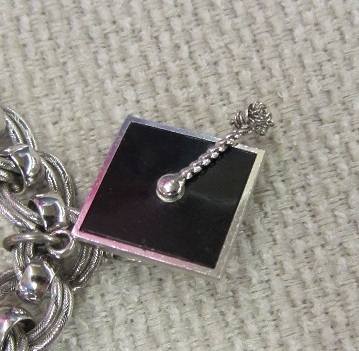 I had my silver one - base bracelet and a graduation cap given to me one Christmas during the middle ages. It was loaded with charms over the years - a real treasure. Then when my home was broken into, sadly it was taken along with many other things. 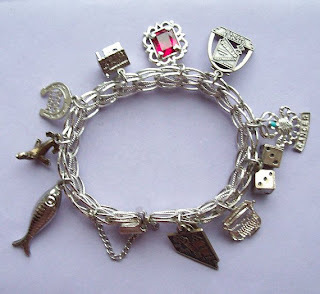 I love charm bracelets and I had one very similar to yours. I had a football, just like you. Thanks for this trip down memory lane! I still have my charm bracelet from high school. 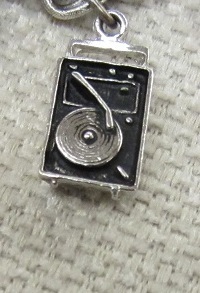 I also have a sewing one and a hummerbird one...I love charm bracelets, but I don't wear them as much as I used to. You have a treasure. Thanks for highlighting charm bracelets, I never had one but my mom does. I will have to take a look at it now! What a treasure. Brings back such great memories. 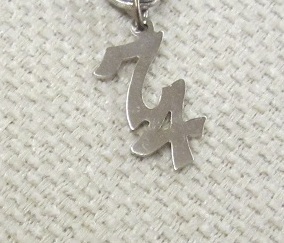 My Mom had one with charms for each child ... seven in all.Enjoy this blog so very much. What fun charms you have! How is the photo one done? I've never seen a photo as a charm like that. Is it laminated? So sweet. It does bring back the memories. I never did get that charm bracelet I wanted. Love your grad picture! Love charm bracelets! I grew up during that time, too, and I still wear mine. . . Love the jingle of them! I still love charm bracelets. I had one back in high school that it still have. Yours are awesome. Its like a little walk down memory lane! Thank you for sharing at TTF. Have a terrific day! I love your charm bracelet! Thank you for joining Home Sweet Home! These bracelets are really fabulous. I love it. It is so adorable. Thanks for sharing these amazing bracelets.